* Unique solution for emergency rescue and evacuation from a wide range of elevated work areas. 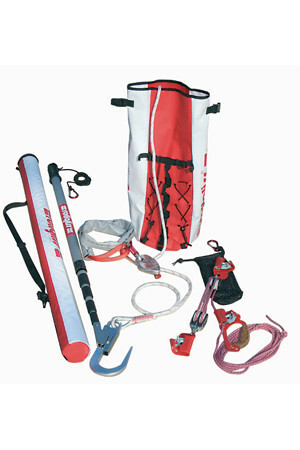 * Versatile system is ideal for self rescue, multiple evacuations or even assisted rescues - rated for two person rescue. * Compact and lightweight design with fully automatic controlled descent at 0.9m per/second enables fast and safe rescue. * Unique bi-directional design allows one end of the lifeline to descend while the other ascends ready for another rescue. 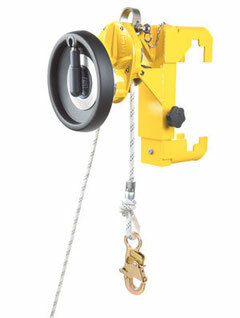 * Optional lifting wheel helps facilitate safe assisted rescue from a distance. * Fast installation and easy operation enables efficient and effective rescue. * Device is designed from high-quality and corrosion resistant materials for maximum performance and durability. 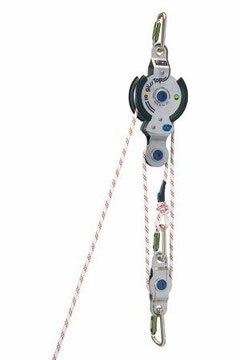 * 10 metre rope rescue system comes with 10m, 20m, 30m and 50m rope. The DBI-SALA Rollgliss® R250 rescue kit has been designed as a peer rescue system for use in industrial environments. The kit has been designed specifically to enable a rescue to be performed by a person or persons where rescue is not part of their normal job function. It is to be used by the rescuer(s) to remove a person from danger without putting themselves at risk by descending to them. Unlike many industrial rope access rescue systems the Rollgliss® R250 rescue kit is easy to operate allowing everyone to use it, no specialist rescue skills are required. The rescue does not involve the use of complex knots or knives – making it an even safer system. Most importantly, the suspended worker can either be raised or lowered by the rescuer to remove them from immediate danger until professional medical treatment or rescue support personnel arrive. * Disconnection of the worker and controlled descent. DBI-SALA’s packaged rescue systems are a perfect rescue/retrieval safety solution. You can go onto the job knowing that your equipment is ready to go; totally compatible and built with DBI-SALA quality.